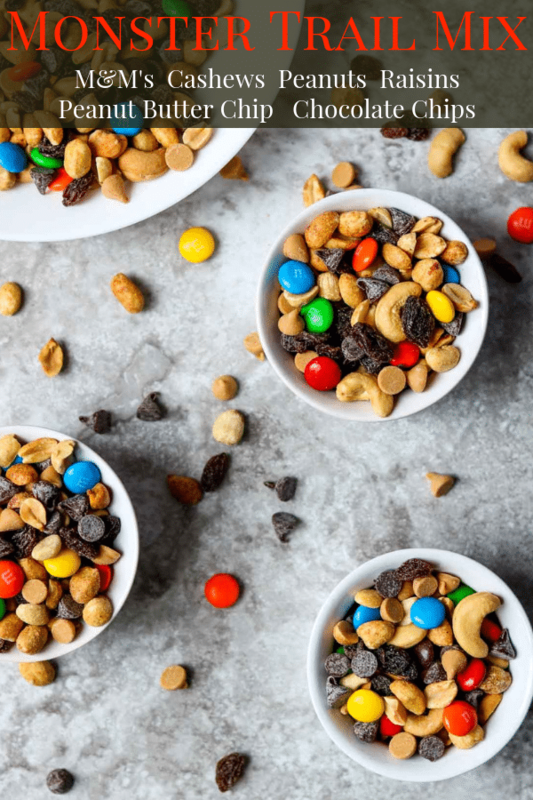 If you love a homemade trail mix or snack mix then this recipe is for you. 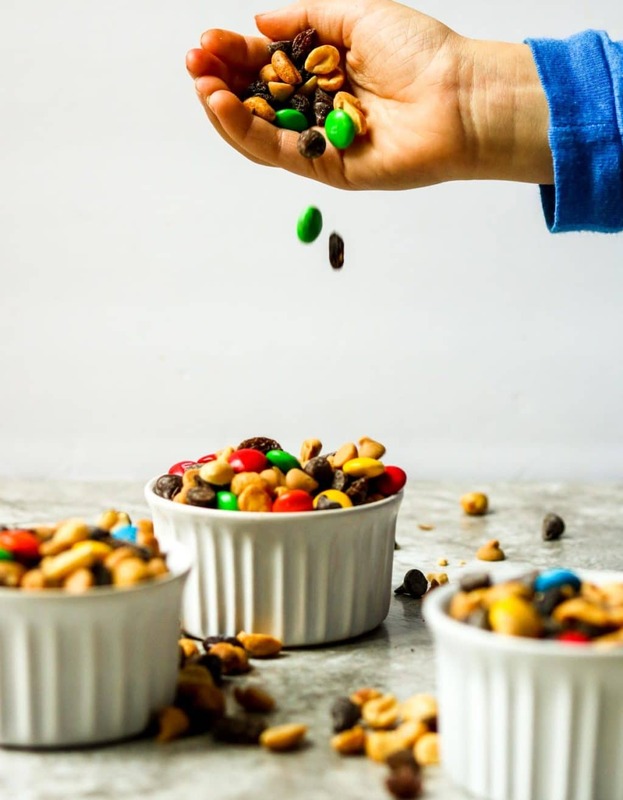 This is one of the best homemade trail mix recipes ever, in my opinion! 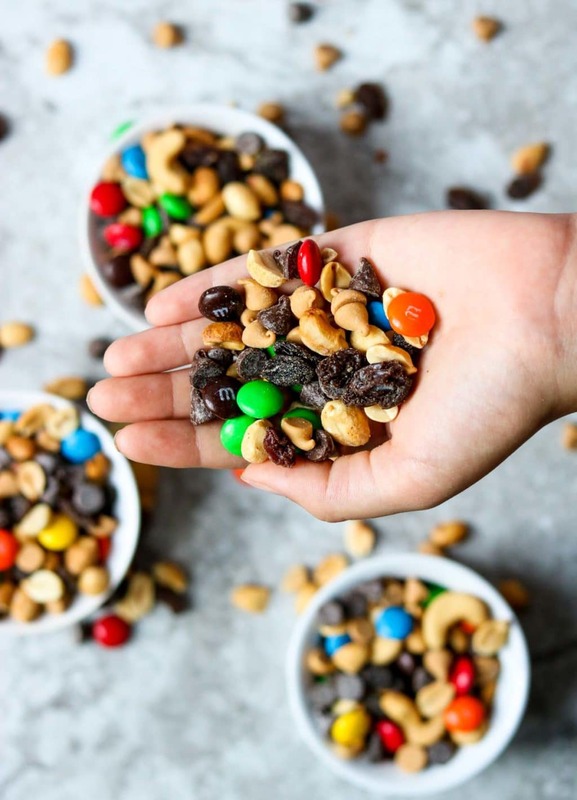 This Monster Trail Mix is full of salty peanuts, and cashews, sweet M&M’s and peanut butter chips, semi-sweet chocolate chips, and raisins. It is the perfect combo of salty, sweet, crunchy, and soft. This is actually a copycat of the Archer Farms Monster Peanut Butter Mix you can find at Target. 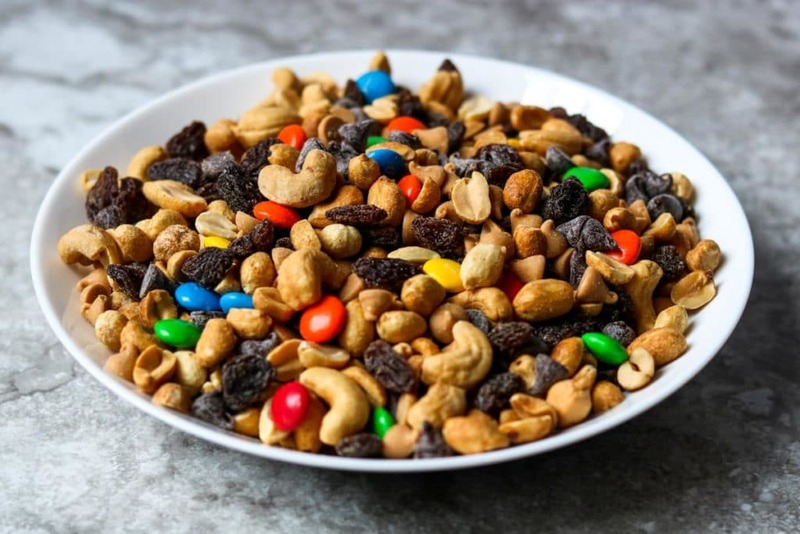 It is one of our very favorite trail mix recipes. But, at $4-$8 per bag I would rather make it at home. Especially when I already have most of the ingredients in my pantry. I usually have the raisins, peanuts, cashews, and chocolate chips. All I need to buy to put this together is a king size bag of M&M’s and a bag of peanut butter chips. My kids love this Monster Trail Mix. Of course, I have to make sure they are not only picking the M&M’s out and leaving the raisins behind! However, I don’t feel so bad about them eating the M&M’s and peanut butter chips when they are mixed with peanuts and cashews. This is also a great snack to make with your kids. I know my kids love to measure, pour, and stir, and that is all there is to this recipe. Place the trail mix in a large mason jar and tie a little gift tag around the neck of the jar. A perfect and simple gift. 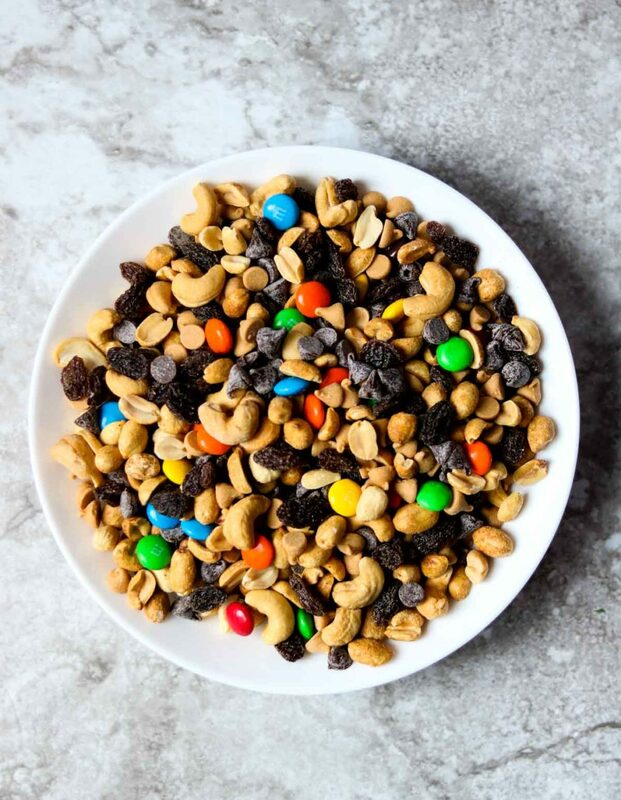 To make Monster Trail Mix all you have to do is stir together all the trail mix ingredients in a large bowl. Couldn’t be easier. If you can measure, you can make this snack. 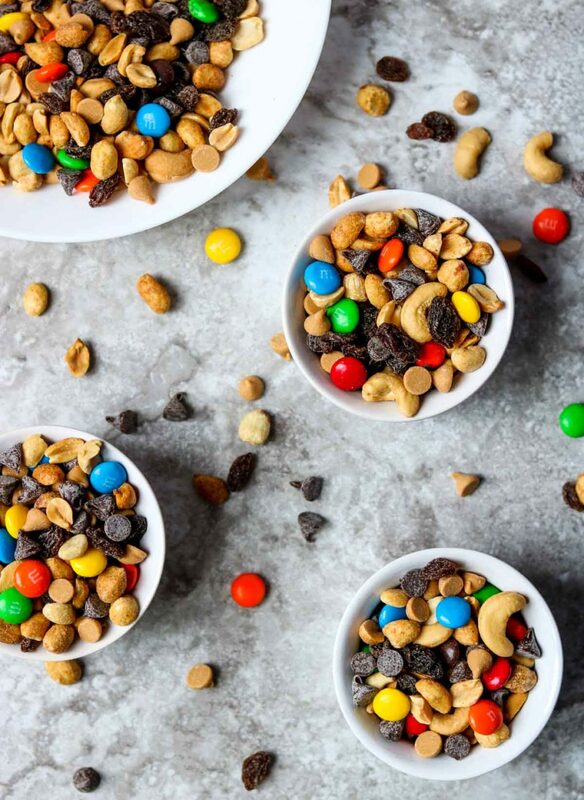 I hope you give this recipe for Monster Trail Mix a try in your kitchen. SAVE THE MONSTER TRAIL MIX RECIPE. PIN IT HERE. 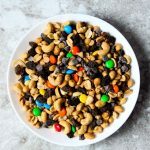 An easy homemade trail mix that makes a great snack and is the perfect balance of sweet and salty, and crunchy and soft. mix all the ingredients in a large bowl and store in an air tight container at room temp. So much easier and healthier making your own!